Elizabeth Sanders lives in Whitesburg, Kentucky just up the road from where she was raised. During the day Elizabeth manages WMMT 88.7FM: a community radio station based at the historic Appalshop. Since 1969 Appalshop has been enacting cultural organizing and place-based media, arts, and education to document the life, celebrate the culture, and voice the concerns of people living in Appalachia. WMMT has been broadcasting to the coalfields of eastern Kentucky, Southwest Virginia, Southern West Virginia and beyond since 1985. Elizabeth’s work doesn’t end with her day job, though. Outside Appalshop, she’s an active organizer working across issues from prison abolition to resisting the rise of white nationalists in the mountains. She’s a badass embroiderer and human-parent to a rescue dog named Clyde. Elizabeth wrote in as a part of our Combating White Supremacy initiative about the work she and her crew are up to in the coalfields of eastern Kentucky. Rachel Garringer: How does white supremacy show up in your community? Elizabeth Sanders: One of my earliest memories of white supremacy is around how we were taught about slavery and white settlers in Appalachia. I was taught that slavery was this distant thing that we have no responsibility for. First, I believe the U.S. needs to pay reparations. But, at a most basic level, kids should be taught the truths of slavery, and know that it is up to us/them to make sure nothing even close to that happens again (side eye to prisons and our criminal justice system). We were also taught that Central Appalachia was just “hunting ground” for indigenous peoples of the area – that no one actually lived here. I can’t tell you how many times I was taken to see “The Jenny Wiley Story” as part of a school field trip. If you’re not familiar, look it up. We were basically taught that a) this was our land to take and that b) the indigenous folks who were around scalped white kids. Those were my takeaways as a young kid, anyway. But white supremacy in my community also looks like the Nazis coming to Pikeville, Kentucky (the next county over from mine) this past April and holding a rally in an effort to recruit more folks. It looks like some folks having the benefit of being able to say, “You should just ignore them, then they’ll go away.” It’s going to Charlottesville, VA a few months later and seeing some of those same Nazis that were in Pikeville and some people still not getting it. It’s also the fact that our higher-up elected officials are trying to construct a new federal prison in Letcher County, Kentucky where I live. It's the only federal prison proposal in the country right now. The US has 5% of the world’s population and 22% of the world’s prison population, incarcerating more people than any other country. We don’t need more prisons, we don’t need prisons. We need to be decarcerating. And communities know what they want and need. But who has the power? You can bet someone’s benefiting – but it’s not the communities where the prisons are located or the where the people who are locked up come from. RG: How do you define white supremacy? ES: It's a system that works to maintain the idea that the white race is superior. It’s those with power in political, corporate, and religious spheres, among others, that work to uphold, perpetuate, and protect white privilege. But it’s also those without quite as much power who also uphold those same things, sometimes most evident at an interpersonal level. I think right now a lot of folks associate white supremacy just with Nazis, the KKK, and other similar groups. I read somewhere— I wish I could remember where— that all of those groups could be eradicated and white supremacy would still be alive and well. I believe that. RG: Working for social change isn't an individual effort. Who do you roll with? ES: I roll with a lot of people. I'd say the folks I feel most solid in rolling with are those that I've built political affinity and trust with over the years, and where there's a friendship at the base of the relationship. Most recently I've been working with groups and networks like the Letcher Governance Project (LGP), the Southern Movement Assembly organized by Project South, and the Holler Network. I'm a member of Southerners On New Ground (SONG) and, until I aged out, I was a member of the Stay Together Appalachian Youth (STAY) Project. I spend most Monday nights working with a crew of folks on Hot 88.7 Hip Hop from the HillTop/Calls From Home. Every Monday, from 7-9pm, we run a hip hop show on WMMT. While the show is being broadcast, one of us is upstairs recording shout outs from friends and family of those who are locked up in our listening radius. That's how I first got involved with the station as a volunteer in 2010 and am grateful to still be part of that team today. It's been a privilege to get to know some of the families and guys on the inside while trying to connect and amplify some of the most silenced voices in our community. But, yeah, I roll locally with folks who think it's necessary to push back on the bad while also pushing to create space for our community to really prosper. I roll with folks who’re willing to learn and grow with each other around what it means to do work and organize given the context of our background and geography. I roll a lot with folks who know what it means to work, live, and organize in rural areas and the South. I roll with antifascists. I roll with anarchists. I roll with folks I laugh with, cry with, sing Dolly Parton with, play Dungeons and Dragons with. And sometimes those people are all of the above. RG: What are y'all working on right now to fight white supremacy? ES: With the Letcher Governance Project we’re working to oppose the federal prison that I mentioned earlier. It’s hard, because, people need jobs here, badly. And even though the proposed prison wouldn’t bring the number of jobs promised, a lot of people would still rather have a few than none. But we cannot build the future of our community on the backs of other people’s suffering. If you’re Black in the United States, you’re five times more likely to be locked up than if you’re white. We’re talking about a system that’s working as it was designed to. The criminal justice system isn’t failing - it’s thriving on white supremacy and it’s our responsibility to do everything in our power to dismantle that system. To me, it’s a shame that this proposed prison is what our higher-up elected officials put forward as an economic development strategy, when our local planning commission went to them for support. The federal government allocated $444 million in their budget for the prison, which would be built here in Letcher County. We did a hashtag campaign asking folks in the area if it were up to them, what they would spend $444 million for. The answers were varied and creative, and got to the root of issues folks know exist in the community. Like a holistic state-of-the-art drug rehabilitation center. That was one of the ideas that kept coming up, but there were many. 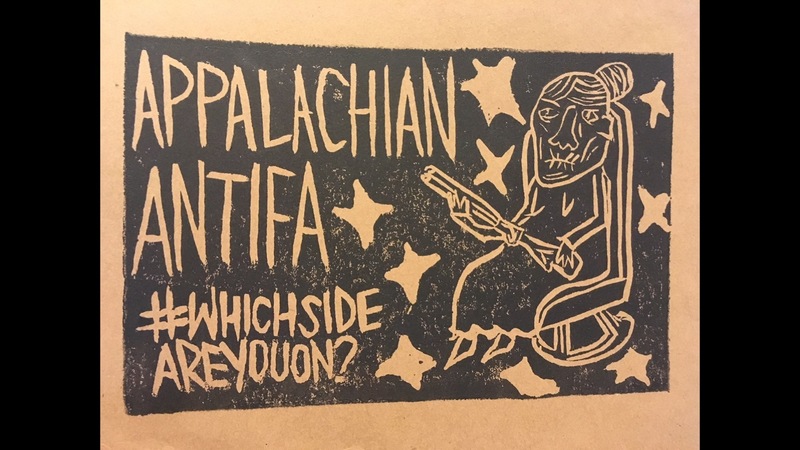 There’s also a network of folks who’ve connected over the past year to do more work around anti-fascism and anti-racism in Appalachia. It’s called the Holler Network and one of the projects going on right now is a pop-ed style workshop tour people in the network have designed for different college campuses talking about white supremacy and white nationalism overall; and then, more particularly, about what that looks like in Central Appalachia and what groups are doing to oppose it. It’s everything from being aware of what white supremacist groups are actively trying to recruit in the region to gathering and sharing individual and collective stories of resistance from the places we live to making plans of action to both support our communities and push against these forces. Everyone in the room has important knowledge and experience that help us all get a better understanding of our history, present, and where we want to go. RG: What do you think it's going to take long-term to eliminate white supremacy? ES: For me? Organizing more white folks, stepping up, taking action - but taking action based on the lead of indigenous folks and folks of color. Listen to them. Be accountable. Figure out what that accountability actually means for your core group and with those you’re working in concert with or adjacent to. Figure out where you can fit in, learn new skills, step out of your comfort zone. Don’t be silent. It’s going to take resoluteness. RG: What advice do you have for folks who want to get involved? ES: Check out the groups I mentioned. Most all of them have websites and Facebook pages. If you're interested in the Holler Network’s pop-ed workshop, shoot an email to thehollernetwork@protonmail.com. Look up the Movement for Black Lives Policy Platform and from there determine how you can do work to those ends. Listen and watch for how grassroots POC groups near you are moving. If you're white, see how they're asking you to engage. And then do it. Act. What this moment can't afford is our silence and complacency. Rachel Garringer hails from southeastern West Virginia. She has written and edited for Scalawag since 2015 and is the founder and director of an ongoing oral history project called Country Queers. A death row prisoner explains why taking away therapeutic programs is a big mistake. What will it take to truly end wealth-based detention? More than a single law, Atlanta shows.